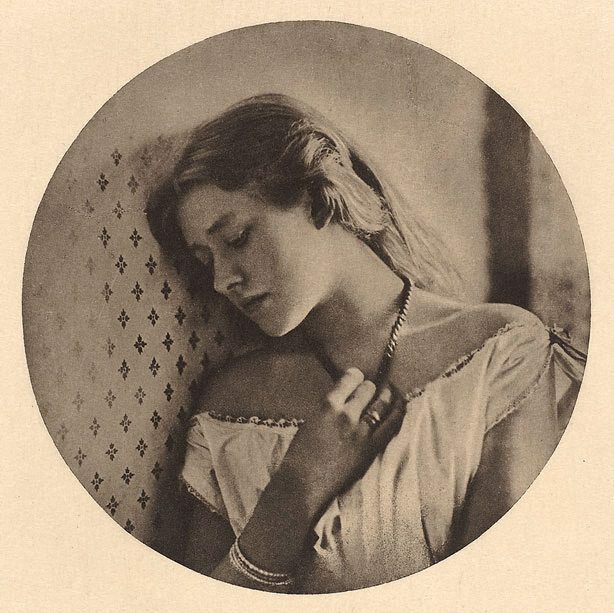 The portrait of Ellen Terry was taken in the same year that Cameron began to work as a photographer. Originally titled ‘Sadness’, presented in a vertical oval format and in reverse, this image has been the subject of much conjecture.1 Ellen Terry was a renowned Shakespearean actress from a theatrical family who, at the age of 16 when this portrait was taken, was already a seasoned performer. Terry had been introduced to Cameron’s close friend and neighbour, the painter George Frederick Watts, in 1862. Cameron and her sisters played matchmakers and thus Terry and Watts (who was 47) married in February 1864. The union was not a happy one and they separated within a year and were divorced in 1877. It is assumed that this photograph was taken after they were married, when it was clear that it was not a success. The wedding ring is in evidence on the hand which fingers the necklace. The pose – leaning against a wall with eyes downcast and a sombre expression – is forlorn. The girl, regardless of her name, is young and beautiful. Her bare shoulders, light gown and loose hair pushed back from her face combine with the pose to suggest a narrative which is enhanced by the original title of the photograph. The later title from 1875, ‘Ellen Terry, at the age of sixteen’, suggests a different narrative which is very much to do with Terry’s professional life as a famous actress. Whether she is posing in character and illustrating sadness for her public or representing her failing marriage is a moot point. The image in the collection is a 1913 photogravure as published in ‘Camera Work’ of that year and is the later of the two versions. Unlike most of Cameron’s female portraits, the assumed character is not specifically literary or religious.